The U.S. energy and transportation sectors are unprepared for the impacts of climate change they are helping stoke, according to a new federal report that warns of "longer and more frequent power interruptions." U.S. infrastructure is threatened by higher temperatures, stronger storms, increased flooding and longer, more intense droughts, according to the Fourth National Climate Assessment. While locational effects differ, "all regions will be affected by climate change," the authors conclude. The assessment is the first federal climate change report written wholly under the Trump administration and its release on Black Friday was widely viewed as a tactic to limit its circulation. Experts say humans have about a decade to prevent the most catastrophic impacts of climate change and the U.S. is behind the necessary pace of emissions reductions to do so. The fourth edition of the National Climate Assessment shows how the U.S. economy will suffer if it and other nations do not take drastic action to reduce greenhouse gas emissions in the near future. The report, written by scientists from 13 federal agencies, warns that annual economic impacts of climate change on some industrial sectors could reach the hundreds of billions of dollars by the end of the century — more than the yearly gross domestic product of many U.S. states. 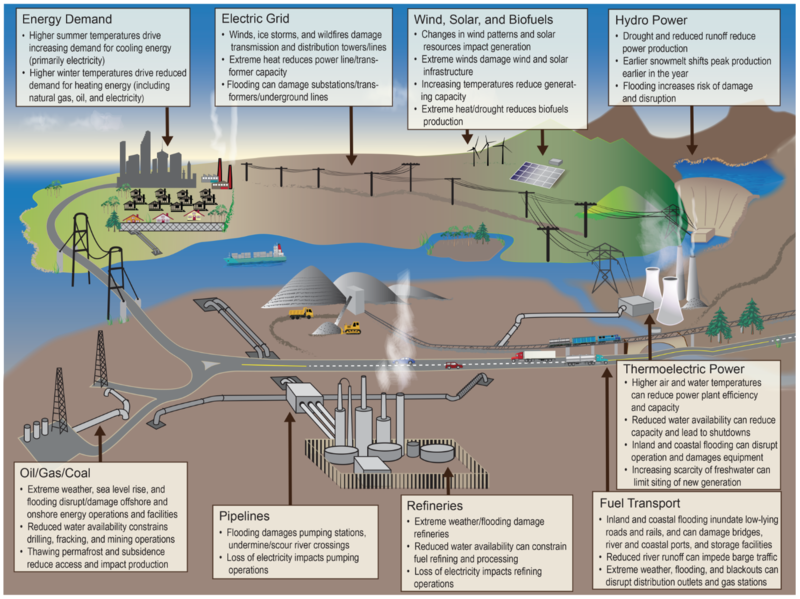 One sector especially vulnerable is energy infrastructure. In the Southeast U.S., scientists estimated that rising sea levels will expose 69 power plants to storm surge from Category 1 hurricanes, and 291 plants to surge from Category 5 storms. If sea levels rise more than three feet, a moderate estimate by the end of the century, the report also warns that dozens of power plants currently not at risk for 100-year floods would be put under threat. "This would put an additional cumulative total of 25 gigawatts (GW) of operating or proposed power capacities at risk," scientists wrote. In Delaware and Florida, the number of flood vulnerable plants would double, while it would more than triple in Texas. Too little water can also threaten power infrastructure, as coal, gas and nuclear plants rely on a steady flow to cool their generators. Scientists warn that a warmer climate will exacerbate drought conditions in many regions, putting those plants at risk. "[T]he output potential of power plants cooled by river water could fall by 7.3% and 13.1% by 2050 under the [low] and [high climate impact] scenarios, respectively," researchers wrote, warning that some plants may have to shut down to avoid water use penalties. Hydroelectric generation would also be limited by enhanced droughts, they note. A warmer climate will also affect grid infrastructure, the report warns, by exacerbating electricity losses on power lines and exposing more substations to storm surge and flooding. "70% of the grid's transmission lines and power transformers are over 25 years old, and the average age of power plants is over 30 years old," scientists note. "The components of the energy system are of widely varying ages and conditions and were not engineered to serve under the extreme weather conditions projected for this century." "Extreme weather and climate change can potentially impact all components of the Nation's energy system, from fuel (petroleum, coal, and natural gas) production and distribution to electricity generation, transmission, and demand," report authors wrote. Another sector in the crosshairs of climate change is transportation, scientists warn. By 2090, damages to paved roads alone are estimated to cost an annual $20 billion in a high climate impact scenario. While warmer temperatures may extend the construction season in some regions, "[w]arming winters will also change the timing and location of freeze and thaw events, potentially increasing pavement cracking and pothole conditions," scientists warn. Extreme weather events will also increasingly threaten critical roadways. "Inland flooding, projected to increase over the coming century, threatens approximately 2,500 to 4,600 bridges across the United States and is anticipated to result in average annual damages of $1.2 to $1.4 billion each year by 2050," scientists wrote. To avoid the most serious impacts of climate change, the United Nations warned in October that the U.S and other nations will need to dramatically reduce their greenhouse gas emissions to nearly zero by 2030. The U.S. is not on track. Emissions from the electric power system are expected to stagnate over the next few years, the Rhodium Group, a research firm, said this summer, while transportation pollution is set to increase.